The title is a bit of an exaggeration. Even back in 2010, there was plenty to criticize Putin for, and since then, the details haven’t even changed that much so far as I’m concerned (e.g. corruption, bureaucracy, white elephants). And it’s not that I have been unremittingly anti-Putin in the past few years, regardless of the “powerful takes” of random sovoks and the more rabid Putinistas. That said, there’s no question that my personal “approval rating” of Putin fell from around 75% during the 2008-2013 period, which peaked at close to 90% during the excitement of the Russian Spring in early 2014, to perhaps just 50%-60% during the ensuing period of never-ending zradas on the Donbass Front, the incessant persecutions under 282, and Putin’s own increasingly evident senility. More blackpilled articles on tech, the Ukraine, etc. The Three Faces of Putin: VVP, putlet, PUTLER! During 2008-2013, he was Putin – a strong, reasonably effective leader; not a visionary like Peter the Great, but at least a solid, state-building Ivan III. This was reflected in his initials, VVP – which translate to “GDP” in Russian. During the 2000-2014 period, this is exactly what Putin was defined by: Raising the VVP, sprouting malls, consumerism. This might seem crass and materialistic, but only to people in societies that were much richer than Russia thanks to their luck in avoiding Communism. We want what we don’t have. There’s little room for developing spiritual and thymotic values on an empty belly. But soon after the height of his triumphs, he started regressing into a pathetic putlet – so much so that I even ended up voting for Zhirinovsky in protest. However, the failures in the Ukraine regardless, there have been so many substantive changes for the better in the past year that I am revising his status back to standard issue Putin. Putin raising the pension age was a truly heroic and necessary step that demonstrated that he still has vitality and the will to do the right thing, regardless of the wailing of the mob. Though he did eventually roll back the target retirement age for women to 60 from 63, which was pretty weak. Nonetheless, this is a very encouraging contrast to the example of Poland, where the retirement age has been reduced by the conservative populists of PiS to the detriment of its long-term fiscal outlook. This is on the background of raising Russia’s position in the World Bank’s Ease of Doing Business rankings from 120th to 31st between 2012 and 2018. An unsung achievement that will benefit Russia in the years to come. One of my biggest peeves with policy in the past decade specifically is that the state of Russian science and R&D has been pretty lamentable – see my article on that. Though one can’t blame everything on that, the paucity of funding played a significant part. Not clear how one can expect stellar results when Roskomnadzor (the Internet censorship authority that has followed up its blocking of Telegram with a block on Sci-Hub and a bunch of torrenting sites – so much for my suggestions of making Russia into a pirate heaven) gets 10% as much funding as the entire Russian Academy of Sciences (which accounts for about 40% of Russian science production). However, things are looking up. Researcher salaries were almost doubled in 2018. For the first time since the end of the Soviet Union, academia is again a financially viable profession. As I have often pointed out, Russia is more Russian (82%-85%) than the “Jewish state” of Israel is actually Jewish (75%), so why do we have to pretend we are a “multinational” federation? Unlike the US or Switzerland, Russia was not constituted as a federation, a set of independent states that voluntarily joined up in a union while reserving some of their own laws, specific privileges, etc. Russia was always an empire, and it should act as one. And while much work remains to be done in this sphere, there have been at least a couple of concrete and substantial improvements. First, there were legal changes that made the learning of ethnic minority languages in Russia’s national republics voluntary. This had the biggest effects in Tatarstan, where Russians (Bashkirs, etc.) previously had to learn Tatar. It is bizarre that non-Tatar pupils had to waste hundreds of hours of their lives learning a pointless language thanks basically to sovok-era borders and it is great that this is no longer the case, even if it did make Tatar bureaucrats very sad. Second, the local, crony powerbreakers of Dagestan have been cleaned out and replaced with a “colonial” administration disproportionately composed of Russians and Laks (a traditionally more modernized and pro-Russian ethnicity). While I am skeptical about the long-term utility of keeping DICh within the Russian Federation, if they have to stay, it is best that they serve some purpose instead of constituting a bottomless money pit feeding local elites. The latest policy moves on immigration reform are highly encouraging. I have written about this in greater detail in previous posts, so I will not dwell long here. But to cut a long story short, current suggestions are are both pro-human capital and pro-Russian, which also makes them implicitly anti-Ukraine. As I pointed out, PUTLER! might as well have been reading my blog. Another law easing restrictions on asylum policy has also been passed. Unfortunately, this was too late for Olena Boyko, but hopefully the endless ghastly sagas of pro-Russian Ukrainians getting deported straight into Ukrainian jails for “migration violations” can finally come to an end. The past few years have seen a steady diminution of official identification with the Soviet era in favor of Tsarist and White symbology. In recent months, prominent monuments to Ivan III, Alexander III, and Solzhenitsyn have gone up. Though its questionable to what extent this is something driven by the authorities and to what extent it is a natural development, but provincial cities have been getting nicer and more beautified since 2014, despite a long recession. Putin personally submitted a bill to soften Article 282, Russia’s hate speech law. Once again, it is good to see my blog is being read and acted upon at the very highest levels. Caveat: As usual, this is a halfway measure. It only decriminalized Article 282, so one can still receive a modest fine for “hateful” speech; moreover, if you repeat the offense within a year, it becomes a criminal offense. Still, for all practical purposes, this removes the ability of the residual sovok swine that still dominate the Russian judiciary to jail Russians for saying things like “it’s time to do away with this strange economic system” (Konstantin Krylov), “the great Russian people” (Dmitry Bobrov), and quoting statistics on who subsidized who during the Soviet era (Roman Yushkov). Not much to be done about the Ukraine by now, but there have been some very encouraging developments on the Belorussian sector in recent months. Honestly, if Russia can’t even get back the six Belorussian oblasts, I am not sure it deserves to survive as a state. Given this impressive record over the past year, and especially the past few months, I am going to start toning down my criticism of Putin. Indeed, while Putin’s approval rating has fallen to 60% from 80% because normies were sad over losing a few of their gibsmedats, my personal approval of him has crept up from 50%-60% during 2015-2018 back to a solid 70-75%. True, much remains to be done for Russia to truly become a national state. In my world, all the ethnic republics and oblasts will be replaced with gubernias; all the Lenin statues will be toppled, all the Lenin and Soviet streets renamed; there will be open borders (or no borders) between Russia, Belorussia, and the Ukraine; and it will be the judges and prosecutors who imprisoned people on 282 who will themselves be sitting in Arctic penal colonies. But Rome wasn’t built in a day. 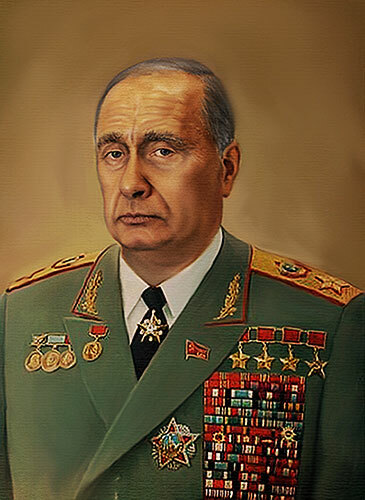 For now, I am once again ready to serve as “ein strammer Putin-soldat.” Hail Putler! * By PUTLER!, for those very slow people unable or unwilling to catch irony, I mean in the sense that svidomy Ukrainians imagine Putin – not a literal Russian Hitler.